Considering the fact that the Paklenica region is a national park, there are strict regulations here concerning the protection of environment and all visitors, and that means climbers as well must obey those regulations. Any kind of damage to the flora and fauna will be penalized. Despite the above mentioned the National Park authorities show understanding for climbers. There are also demands concerning the areas where climbing is forbidden. This includes the entire region of Mala Paklenica. 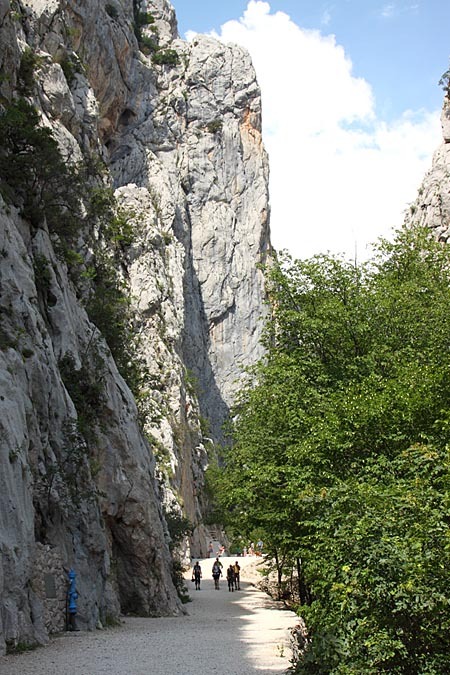 In Velika Paklenica gorge climbing is banned on Debeli kuk from the lower to the upper parking lot (to the bunker). This ban includes routes over 50 m in hight. In the remaining parts of Debeli kuk, routes for climbing are those not higher than 200 m.
Climbing is also banned on rocks on the left handside from Manita peć to the upper part of Velika Paklenica. Rocks of Jurasova glavica and further on up to the upper part of the gorge are rocks on the right handside. These bans are due to a need for protection of habitats of protected birds, but also for safety reasons (Rocks falling!!!). The entrance to the National Park is fee. A 3-day and 5-day tickets are being offe­red to climbers and they can be used within 30 days. The same types of tickets are available for children. It is a good to remind climbers to respect other visitors of the park, as well as the local residents’ right to privacy.